Bulk Edit allows you to update many products at once by uploading a spreadsheet. You can quickly make updates to your product such as Name, SKU, Reorder Level or customs information (as well as other properties listed in the CSV template). Note: If you want to update inventory, you will need to use the Inventory Upload feature. ShipHero provides a few options for you to make changes to your products. You can edit individual products or many at a time directly within the Products view. Products can also be modified using the ShipHero Mobile app. Bulk Edit allows you to make changes to your products using a spreadsheet. This is often useful for when many products require updating, or are being managed in an external program and you need to update them in ShipHero. There are two types of changes that can be made to products. The first type being inventory quantity. Any change to inventory quantities are logged within ShipHero, along with when the change was made, who made the change, the reason. The second type of change is specifically for adjusting the properties of a product, such as name, SKU, barcode, custom information etc, Bulk Edit is designed for this type of change. You can download the CSV template and begin making changes to your existing products. This CSV file can be loaded using any popular spreadsheet app, typically either Microsoft Excel or Google Docs. ShipHero uses the SKU column to match product information to an existing SKU within ShipHero, this is the only required column. You only need to include columns needed for a particular update. You may be wondering why the On Hand column is an option while Bulk Edit is not used for adjusting inventory quantities. This column is used when creating a new product within ShipHero, and is used to set the initial On Hand value for that newly created product. It is ignored for existing products. Refer to this guide if you're looking to adjust inventory quantities. ShipHero provides two methods of inventory organization. These two options are known as Static Slotting and Dynamic Slotting. Your account by default will be Static Slotting. Static slotting provides a primary Bin location as well as any Overstock locations. You can use Bulk Edit to make adjustments to these properties for Static Slotting accounts. They are ignored in Dynamic Slotting accounts. If you're unsure about which type of slotting your account is setup as, please contact support who can assist. If you're managing products in multiple warehouses, you will need to specify which warehouse will be updated. 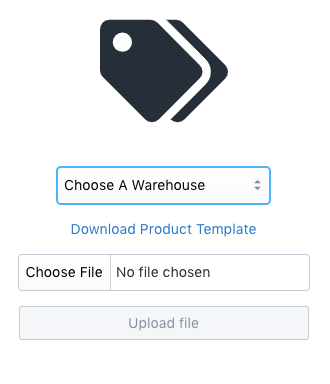 You can do this by selecting the warehouse from the dropdown when uploading the CSV file. This option will only be available if you have more than one warehouse. How Do I Update On Hand for Many Products? How Do I Enable Dynamic Slotting?